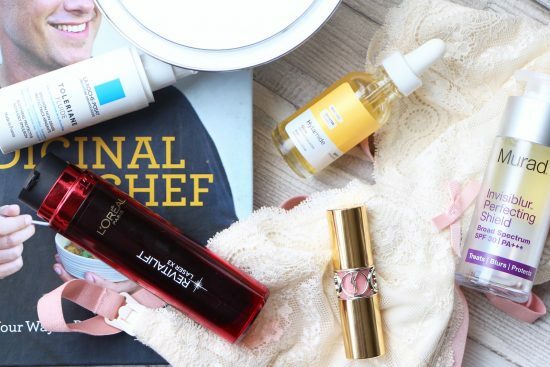 There are perhaps a couple of familiar things in this month’s favourites video; the l’Oreal Revitalift SPF25 is a new discovery and the review very recent, so probably still fresh in your minds, and the Hylamide Glow, a liquid face serum that imparts the most gradual of gradual tans, was a firm favourite at the end of summer last year. I posted about it here, but it has made a spectacular return to my everyday beauty arsenal. Toleriane Fluid from La Roche-Posay is another skincare staple that has returned to the fold – so light and fluid but intensely hydrating, it’s perfect for troublesome oily-and-dehydrated skin. (You can find it online here.) Sticking to the lightweight theme, Murad’s almost entirely weightless Invisiblur Perfecting Shield is a broad spectrum sun protection that leaves a sort of perfecting veil over the skin. It does have some of the dry, velvety-touch finish of a silicone-heavy primer, but not enough to set your teeth on edge.